College DownTime: Wine / Mead Making! Make Alcohol for Less than $10-15! Wine / Mead Making! Make Alcohol for Less than $10-15! You've heard about it from your crazy, eccentric uncle plenty of times and now you want to learn how to do it on your own. Well we've tested wine making quite a few times and have come up with a cheap way for you college students to do it also while still leaving you with beer money for later. 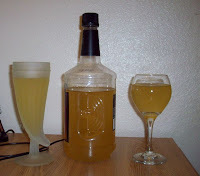 At the end of the article, check out the pics of our mead from last semester. Below are the ingredients and prep you'll need to start your first batch. However, the most important factor in making your very own wine is patience. A decent batch takes about a month to ferment and settle, while an above-average batch will take at least six weeks. 1) A one gallon jug of the cheapest water you can find. I prefer ones with huge caps because it'll be easier to stuff your ingredients through and takes less time to pour out later. 3) Your flavor additives. I've used oranges, lemons, blackberries, raspberries, raisins (ALWAYS INCLUDE RAISINS - they're already fermenting! ), and cherries. High-sugar fruits work great as they give more food for the yeast. Experiment with fruit combos too. Raisins and lemons are almost standard, but I prefer more tart fruit for an awesome flavor. 4) The yeast. Dry-packet yeast is great and for $1.25 you get three packets. Protip: use specific wine yeast for better alcohol content and flavor. 5) Random flavorings/yeast nutrients. You can buy Yeast Nutrient anywhere specialty foods are and it is also available online. It is not needed, but it can turn a decent wine into something great. However, tea is a great alternative. Yeast likes tannin and tea is full of it. Plus, the tea adds some complexity that will impress wine appreciators, should you show off. All this stuff is available at any average dining commons on campus, except the yeast. If you live in campus dorms, wear a jacket or bring a pack. You pay for the food, why not use them to make yourself some tasty libations? Ready to brew? I thought so. Grab your gallon jug, dump half the water into a container for later (you will need it to top off the batch). You will need 3-5 lbs of your sugar-water substance, like honey, maple syrup, molasses, etc. More sugar = a sweeter, stronger wine. 3 lbs honey per gallon is a little dry, but 4 lbs is perfect for a normal batch. I usually use 4 lbs. 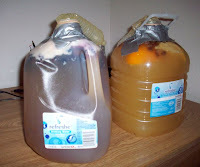 If you're using a juice instead of honey, fill the gallon jug up almost all the way, about 75% full. Heat up the sugar before adding the yeast. It starts the fermentation faster. You want speed right? Now is also a good time to activate the yeast. Put a packet of yeast into a glass with warm water and let it sit for ten minutes. Done yet? Toss your fruit, tea, flavorings, and anything not-yeast into the gallon jug. Make sure it's warm, not boiling. Shake it up a bit, mix it around. This makes the flavor consistent while the yeast eats it. Top it off with the water you were saving until it's at the fill line. After mixing, finally add the yeast, man! Put a cap on and shake that thing up. Shake some more, and then let it sit with the cap off. Within an hour you'll get a nice foam building up (that's the CO2). Put the jug on some paper towels because it will start spewing out over the next few hours. Once you're confident it won't leak much anymore (three hours later), put a balloon on it with a hole punctured in the balloon to allow CO2 to escape. Protip: you're in college and might not have balloons lying around. Use a condom. They're just lying around not being use, amirite? Ha, well just stretch one over the jug's cap and pop a hole when it fills with CO2. Now just let it sit somewhere it won't be disturbed much. A closet, shelf, on top of your old books you can sell, where ever. Now wait a couple weeks and enjoy. Just about all the alcohol is created in the first 2 weeks, but more time = better tasting. But who am I to tell you when to drink? Let the dead yeast settle after fermenting and you'll have a clear, great tasting wine you just made. Enjoy you classy, crafty college students. 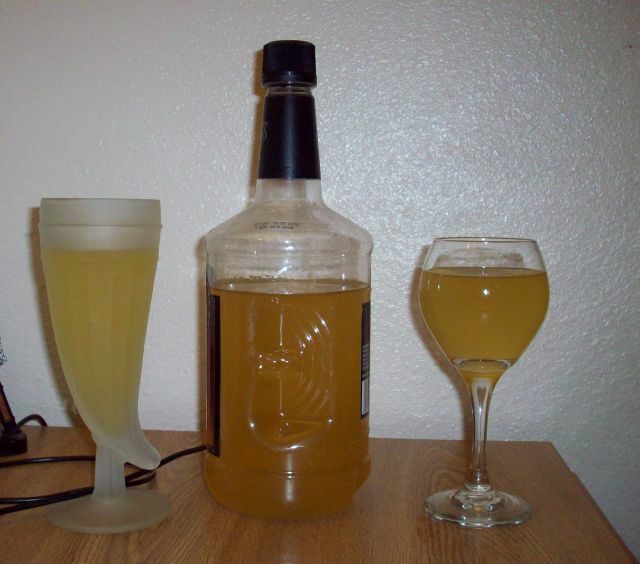 This entry was posted on October 4, 2009 at 12:14 pm, and is filed under cheap, DiY, mead, wine . Follow any responses to this post through RSS. You can leave a response, or trackback from your own site. Also, if making hard cider it is the same process. Use apple cider and add yeast! Just DO NOT USE cinnamon in the process until it's fermented. Cinnamon kills yeast.